That s was a nice apartment building with a very nice rooftop pool and hot tub. The workout room was well equipped with a beautiful view. A very good location for walking to restaurants or carry outs. Excellent place! Staff was so helpful! Restaurants are amazing with delicious food! Excellent staff, service and amenities. Best hotel in South Beach. Miami's one-of-a-kind culture is a product of the tropical weather, beautiful shoreline, thriving businesses and diverse assortment of people from Cuba and every corner of America. From Little Havana to South Beach, discover Art Deco architecture, beach volleyball and Cuban cigar stores in Miami's eclectic mix. Culinary masterpieces are served up at Downtown restaurants like steakhouse Toro Toro, while giant cocktails flow down by the beach on Collins Avenue, and dancing comes later inside some of the world's most extravagant nightclubs, including the iconic Mansion. Sun Life Stadium, previously known as Pro Player Stadium, is home to the Miami Dolphins. From the days of Don Shula and Dan Marino right up to the present day, the Dolphins have unified Floridians and fans across the nation. The Monkey Jungle spans over 30 acres and is home to more than 400 monkeys, most of which are free to explore the reserve. Interested visitors can take tours to learn interesting facts about the different species of primates. The Monkey Jungle hosts scheduled feedings where you can witness the surprising intelligence of these spirited creatures. The Miami Children's Museum is a full-day adventure. Throughout the many exhibits are toys and games for kids to play with. Learning happens automatically in exhibits like the Castle of Dreams, Safety Zone and Everglades Park. The Ocean Odyssey exhibit contains a 900-gallon tank with an assortment of graceful and unusual sea creatures. Another adventure in Florida's cultural epicenter is the seaplane tour. See the city from above after taking off from the waters of Key Biscayne, and obtain a unique view of many of Miami's natural and man-made wonders, from the beaches to the poolside mansions. 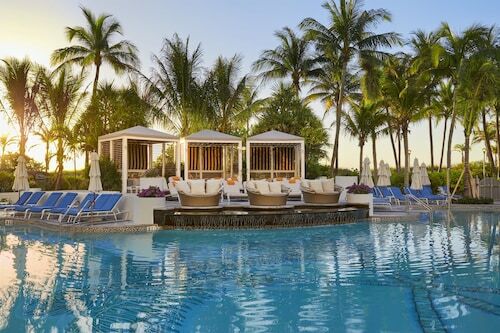 There are a number of Miami hotels suitable for most budgets. Downtown, several high-rise hotels like the well-known Hyatt Regency offer views through floor-to-ceiling windows and first-class amenities. Close to conference centers and Downtown's shops and restaurants, this location is convenient for work or play. On South Beach, the hotels are close to the shore and fun daytime activities the beaches provide. A stay on famed Collins Avenue or Ocean Drive tends to be pricier, while budget options are set just a little further away. Creative types should try the National Hotel in the heart of the Art Deco Historical District, or the cheaper President Hotel, which is styled with glamorous murals. Miami's efficient public transportation system ensures that, wherever you decide to stay during your vacation, the entire city is available to you. Art Deco weekend, which takes place in the Art Deco Historic District in January, sees over 400,000 annual visitors. There is live music, art exhibits, walking tours, and much more for those looking to admire the architecture and soak up the history. The Miami International Boat Show is one of the largest boat shows on the planet. Every February, designers, merchants and enthusiasts converge on Miami to showcase and witness the greatest advancements in boating. Everything from kayaks to multimillion-dollar super yachts are on aquatic display. Florida's climate is pleasant year round. The summers are hot and humid, with highs generally in the 80s and plenty of loud thunderstorms. Winters are dryer and the temperatures in these months average in the high 60s. This makes a winter vacation to the Magic City especially appealing to Americans from states with harsher climates. During any month of the year, locals and visitors party, swim and sun tan in the balmy air. One of the best hostels I've stayed at. Clean rooms and premises, great pool/lounge area with a billiards table and foosball.